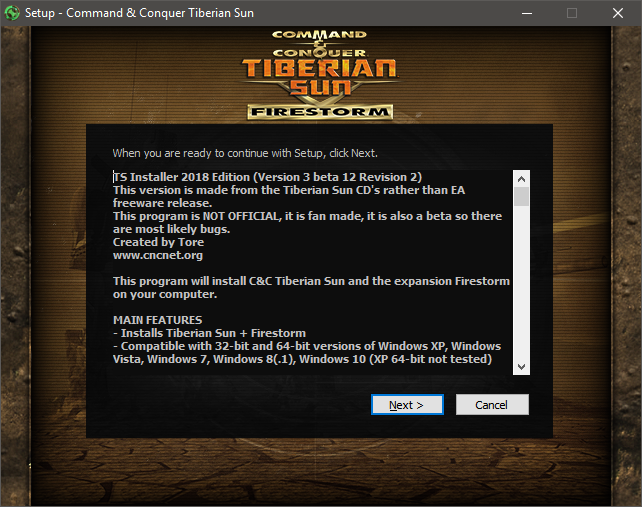 Promoting the release of Command & Conquer 4 EA released Tiberian Sun as freeware in 2010. It is therefore legal to download. The game used to be available from commandandconquer.com. This is a link to Tore's installer for installing Tiberian Sun on modern systems. Updated configuration tool with support for DxWnd. Bug that prevented music and movies from reading from ISO or CD when NoCD was disabled should be fixed. Made from original CD's, not EA's freeware release or TFD. You may also want to look at Rampastring's Tiberian Sun Client, which has many features, but is currently incompatible with the majority of TS players.